(Daredevil II#38) - Mr. Delacourt was selected to represent the state of New York versus Hector Ayala, a little known super hero who was accused of murdering a police officer. Matt Murdock was acting as attorney for Ayala, and Murdock himself was under suspicion for being Daredevil, another super hero. After Delacourt and Murdock selected the jury, the judge informed them of the rules of the court. The judge gave Delacourt a specific warning that any publicity leaked from his staff would result in a mistrial. He also warned Murdock that any shenanigans, such as those previously pulled in Judge Nicholson's courtroom, would result in the same. As they rode the elevator out, Delacourt taunted Murdock with Daredevil suppositions. 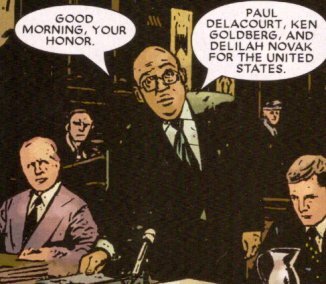 (Daredevil II#39) - Delacourt stood before the jury and praised Officer Scott Perkins, who'd died, and defamed Ayala, vowing that he would see Ayala proven guilty. He listened as Murdock delivered his address. Delacourt interviewed Officer Robert Snipes about his witness of Perkins' body, then called up Officer Darren Arquette. Foggy Nelson tried moving past all the officer's testimonies, but Delacourt declined. Delacourt questioned Mr. Allen and Detective Davis about the gun used and the amulet that granted White Tiger his powers. He objected when Reed Richards, Mister Fantastic of the Fantastic Four, was called by Matt Murdock, but was overruled. Delacourt refuted some of Richards' testimony by confusing his words regarding heroes turning into villains. Later, he questioned several heroes, including Dr. Strange, Luke Cage, Iron Fist (Danny Rand), Jessica Jones, and Bob Diamond. He nearly landed in contempt of court when he asked if Daredevil would be making an appearance. Ayala took the stand and Delacourt humiliated him, calling his character and marriage into question and leading to Ayala screaming out in anger about how the world owed him something. (Daredevil II#40) - Delacourt provided his closing statement, using Nancy Perkins' grieving to support his cause. After Murdock's closing arguments, the jury convicted Ayala of being guilty. Ayala, distraught, ran for it, grabbed a gun, and was shot to death. (Daredevil II#81) - Paul Delacourt, with his partners Ken Goldberg and Delilah Novak, gladly took the case of the United States versus Matt Murdock when Murdock was arrested and exposed as Daredevil. 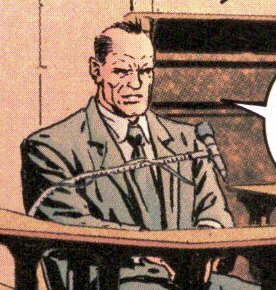 He listened as the judge denied the requests of the super heroes in attendance, including Reed Richards, then listened as Murdock plead not guilty. Delacourt argued that bail should be denied as Murdock was a huge flight risk, and the judge conceded, ensuring that Director Leland Drummond of the FBI had special accommodations for Murdock in Ryker's Island Penitentiary. Despite the arguments from the courtroom, Murdock was taken away in cuffs. Comments: Created by Brian Michael Bendis and Manuel Gutierrez. (Daredevil II#39 (fb) - BTS) - Officer Robert Snipes and six other officers, including Darren Arquette, responded to an emergency call for back-up from Officer Scott Perkins. When they arrived, they found Perkins dead and the White Tiger (Hector Ayala) seemingly the murderer. 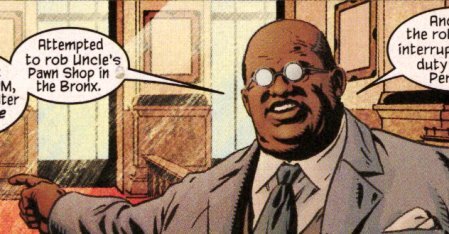 (Daredevil II#39) - Snipes testified in court about the event, questioned by both Foggy Nelson and Mr. Delacourt. (Daredevil II#38 (fb) - BTS) - At some point, Matt Murdock was representing a case in Judge Nicholson's court room, and the events got out of hand with super hero grandstanding. (Daredevil II#39 (fb) - BTS) - Officer Darren Arquette and six other officers, including Robert Snipes, responded to an emergency call for back-up from Officer Scott Perkins. When they arrived, they found Perkins dead and the White Tiger (Hector Ayala) seemingly the murderer. 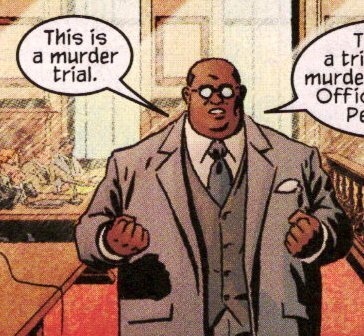 (Daredevil II#39 - BTS) - Arquette testified in court about the event, questioned by both Foggy Nelson and Mr. Delacourt. (Daredevil II#39) - Mr. Allen testified in the case of the murder of Officer Scott Perkins against the White Tiger (Hector Ayala), the presumed murderer. 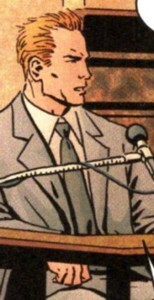 He gave testimony to Mr. Delacourt that the murder weapon had been Perkins' own, and reluctantly admitted to Matt Murdock that the blood found on Ayala's costume could have been spread in another way. (Daredevil II#39) - Detective Davis testified in the case of the murder of Officer Scott Perkins against the White Tiger (Hector Ayala), the presumed murderer. 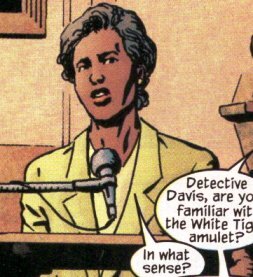 Davis gave testimony to Delacourt about the powers that Ayala's white tiger amulet granted, then reluctantly admitted to Matt Murdock that she didn't consult Dr. Stephen Strange on the amulet as she should have.